I thought I would do something a little different from usual, and share with you my current body care routine. It is very simple and it changes little from time to time, or if there is a new great product or scent. I like to keep it very simple because I found it always better to follow the skincare golden rule of less is more. I usually wash my body with a liquid shower gel, which I find more practical than soap bars, and my current favorite is the Acure Organic Cell Stimulating Body Wash*. I thought I had gone through my first bottle very quickly, and then found out that my husband was helping himself with it too. It has a very subtle scent, and leaves my skin very soft and refreshed. Compared to other shower gels, I find it particularly moisturizing, probably because it contains Argan oil, Sea Buckthorn Oil, and Pumpkin Seed Oil. Lovely. On to body lotion, I have been very faithful to my Earth Mama Angel Baby Earth Mama Body Butter, which despite the name does not have a "buttery" consistency, but has instead a light texture that hydrates the skin intensively. Also, it smells delicious, like vanilla and orange. This lotion is actually meant to help stretching, pregnant bellies to stay hydrated, but I use it as a simple all-over body moisturizer, and I like it a lot. If you are not familiar with this company, Earth Mama is known to take the purity of their products' ingredients very seriously, and holds NSF organic certifications for their essential oils. 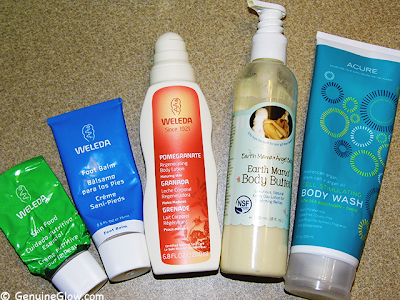 Some days I switch to Weleda Regenerating Pomegranate Body Lotion, which has a more "milky" texture, that feels amazing on the skin. I do not particularly like the scent but I am definitely going to try the Wild Rose or the Citrus scented versions, because I love the texture and how it makes the skin look . Onto legs and feet, with my legs I tend to spoil them with a richer cream, the Weleda Skin Food, (you can checkout my here), to give that extra boost of moisture. At night, when my feet need a little extra soothing, I switch to the Weleda Foot Balm, which is perfect to give tired feet a refreshing and relaxing massage. This is my current basic routine from shower to dresser. What are your most used body care products?